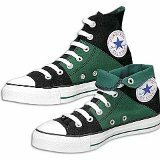 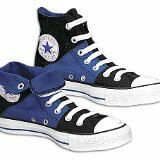 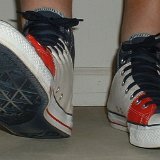 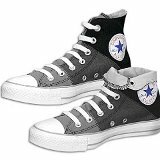 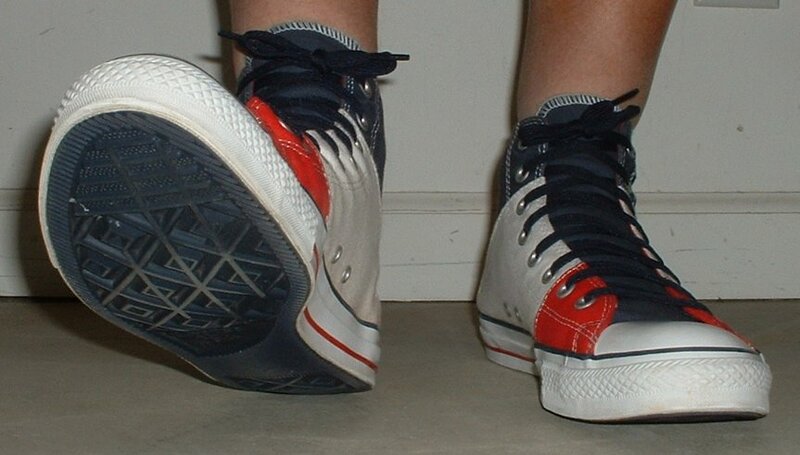 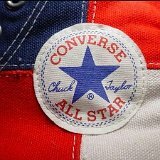 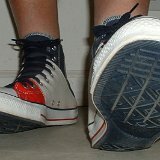 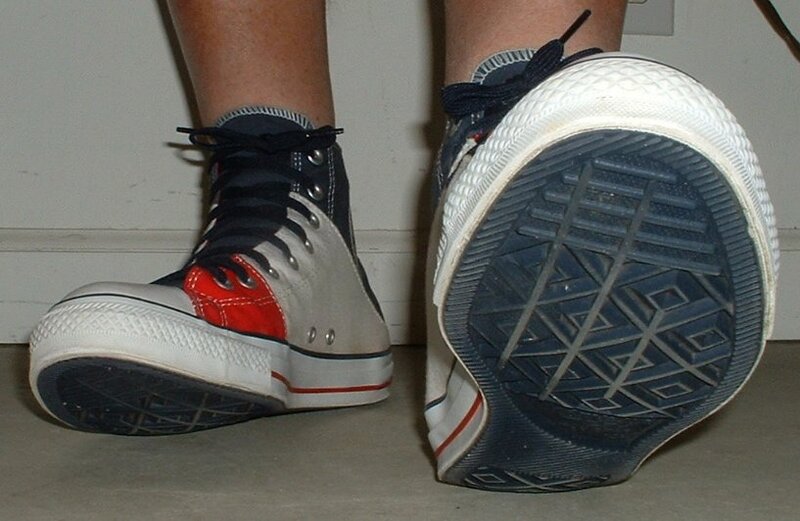 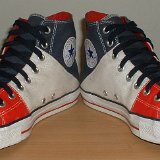 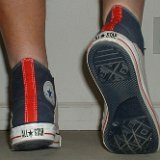 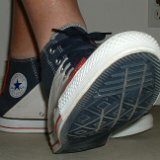 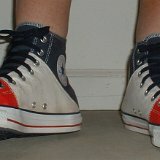 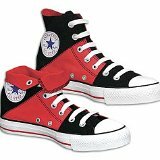 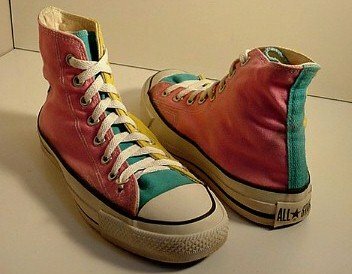 Photo gallery of high top and low cut tri-color chucks. 1 Tri-Color Chucks Angled side view of a black, charcoal, and light grey tri-color foldover high top. 2 Tri-Color Chucks Angled side view of a black, green, and dark green tri-color foldover high top. 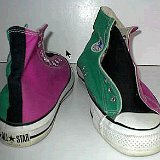 3 Tri-Color Chucks Ouside view of a black and pink tri-color high top. 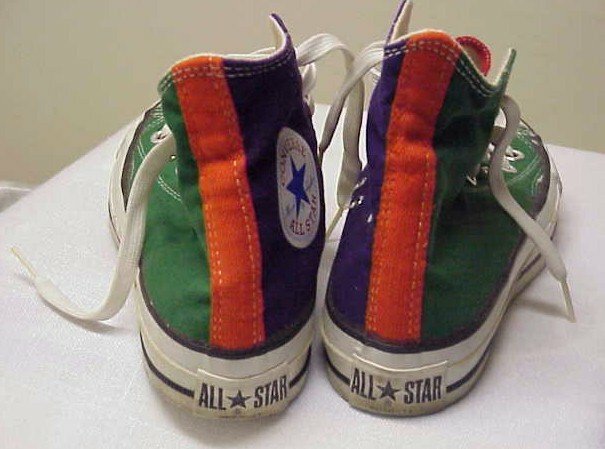 4 Tri-Color Chucks Angled side view of a black, royal, and white tri-color foldover high top. 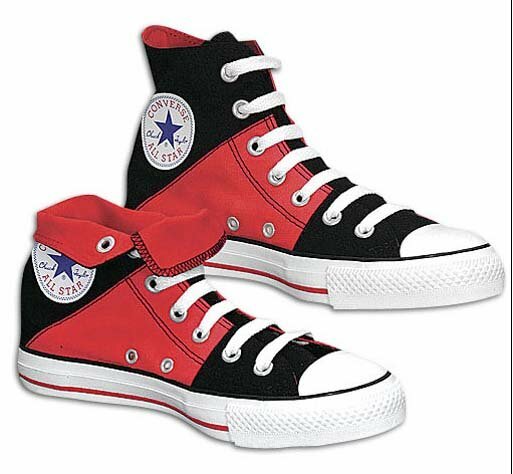 5 Tri-Color Chucks Angled side view of a black, red, and white tri-color foldover high top. 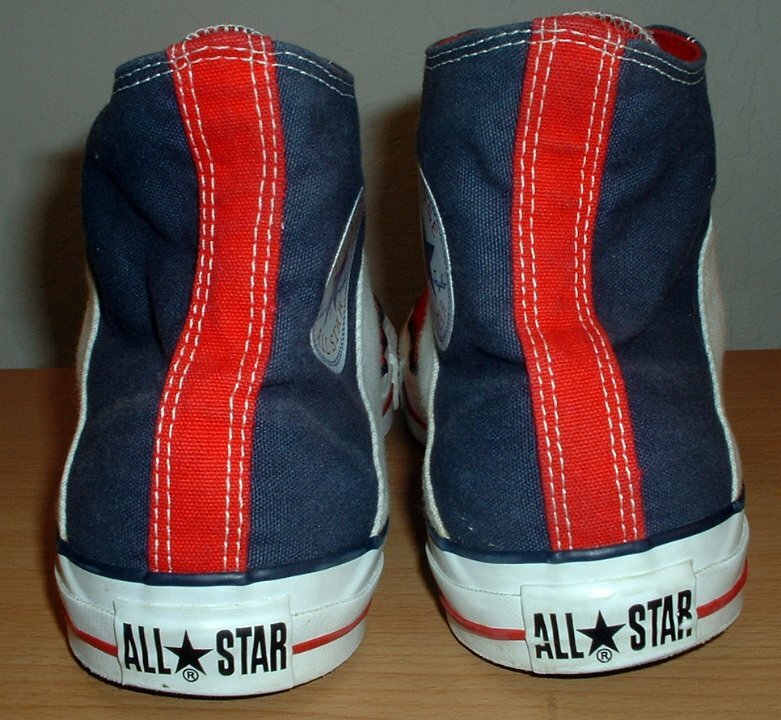 6 Tri-Color Chucks Inside patch view of a right red, white, and blue tri-color high top. 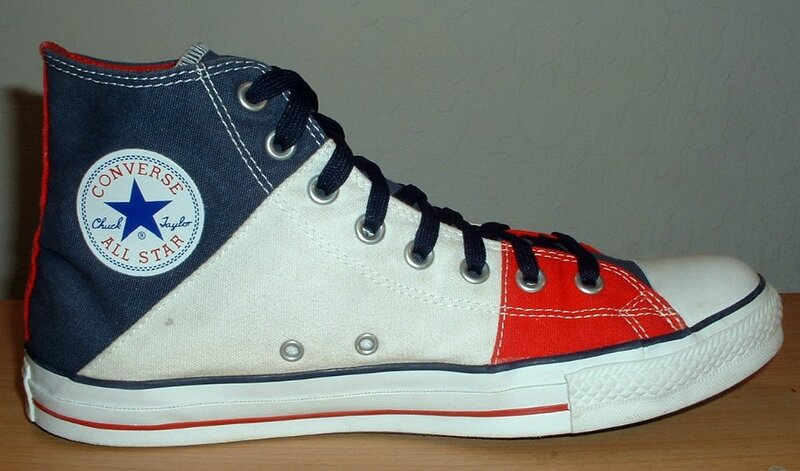 7 Tri-Color Chucks Outside view of a right red, white, and blue tri-color high top. 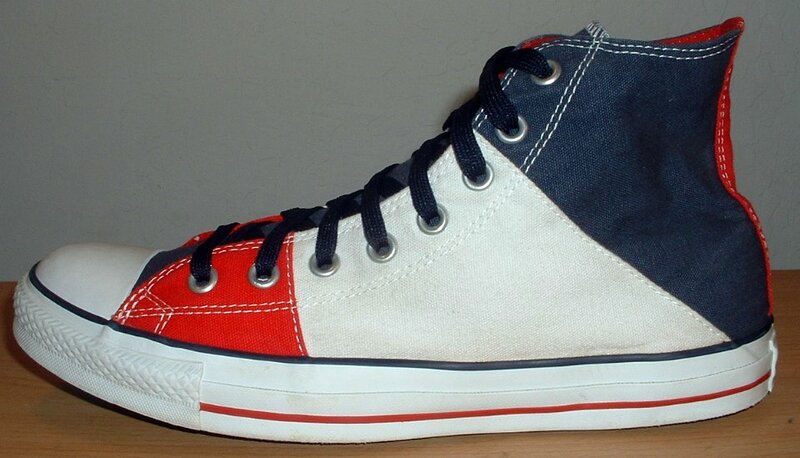 8 Tri-Color Chucks Outside view of a left red, white, and blue tri-color high top. 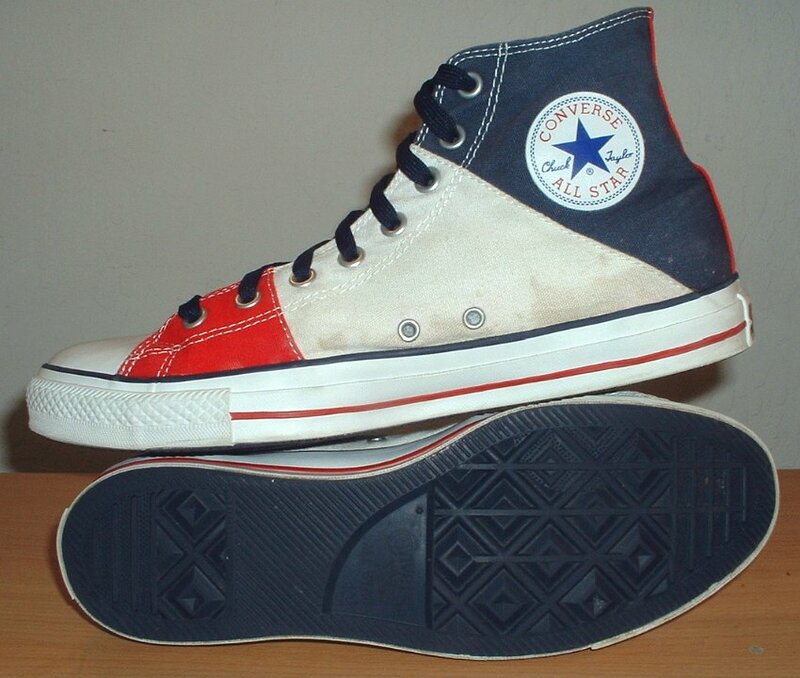 9 Tri-Color Chucks Outside view of a left red, white, and blue tri-color high top. 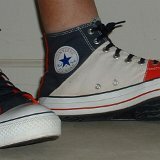 10 Tri-Color Chucks Front view of red, white, and blue tri-color high tops. 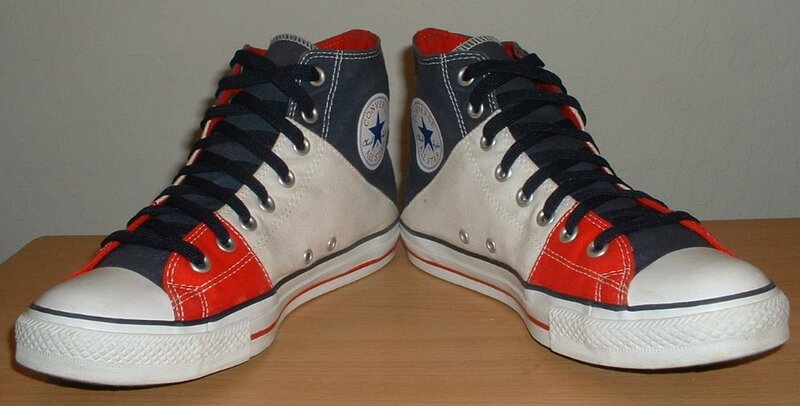 11 Tri-Color Chucks Rear view of red, white, and blue tri-color high tops. 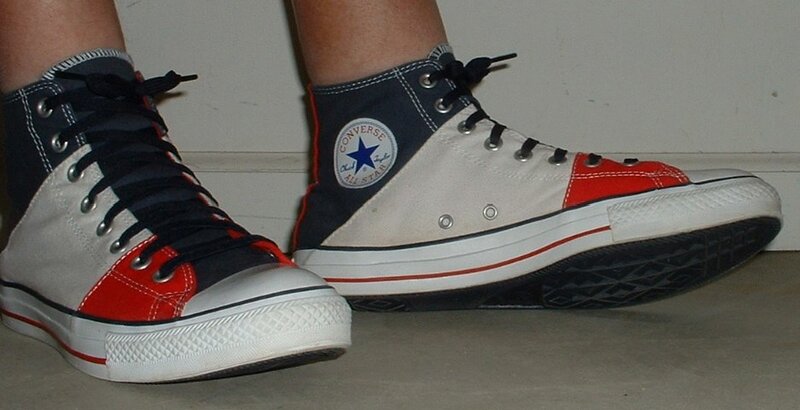 12 Tri-Color Chucks Top view of red, white, and blue tri-color high tops. 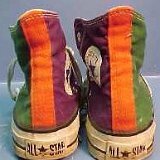 13 Tri-Color Chucks Inside patch views. 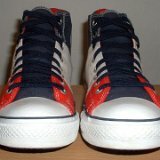 14 Tri-Color Chucks Angled front view of red, white, and blue tri-color high tops. 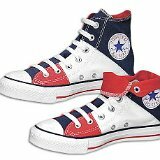 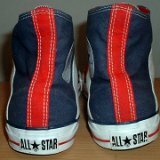 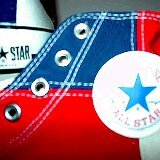 15 Tri-Color Chucks Inside patch and sole views of red, white, and blue tri-color high tops. 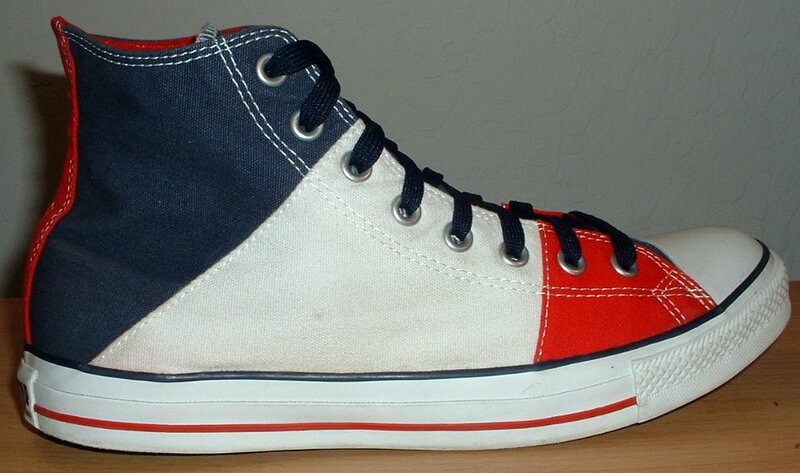 16 Tri-Color Chucks Angled side views of red, white, and blue foldover tri-color high tops. 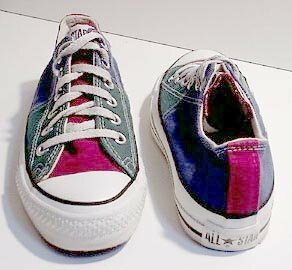 17 Tri-Color Chucks Inside patch and top views of maroon, green, and blue tri-color high tops. 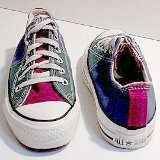 18 Tri-Color Chucks Rearp view of maroon, green, and blue tri-color high tops. 19 Tri-Color Chucks Inside patch and top views of maroon, green, and blue tri-color high tops. 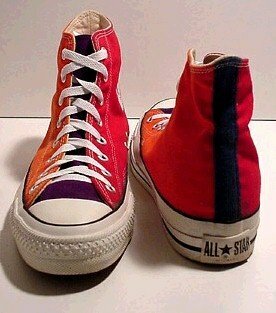 20 Tri-Color Chucks Rear and side views of purple, red, and natural white tri-color high tops. 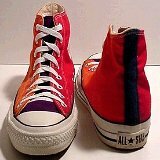 21 Tri-Color Chucks Rear and side views of purple, red, and natural white tri-color high tops. 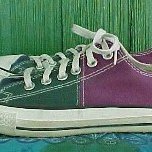 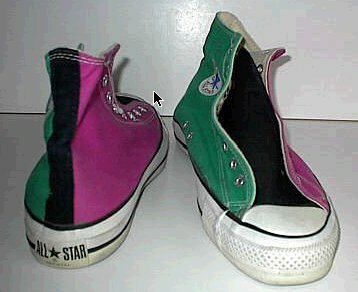 22 Tri-Color Chucks Front and back views of green, black, and light purple tri-color high tops. 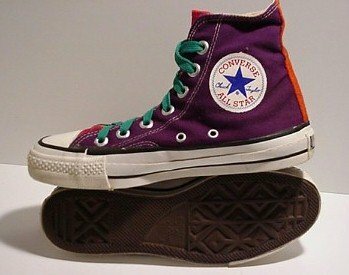 23 Tri-Color Chucks Side views of green, black, and light purple tri-color high tops. 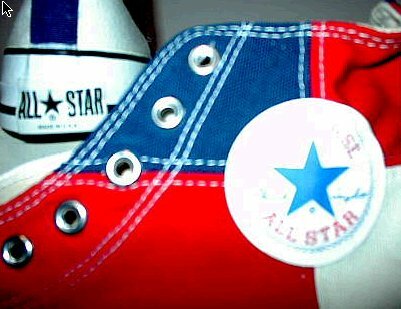 24 Tri-Color Chucks inside patch views of red, white, and blue tri-color high tops. 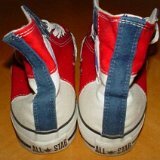 25 Tri-Color Chucks Inside patch view of red, white, and blue tri-color high tops. 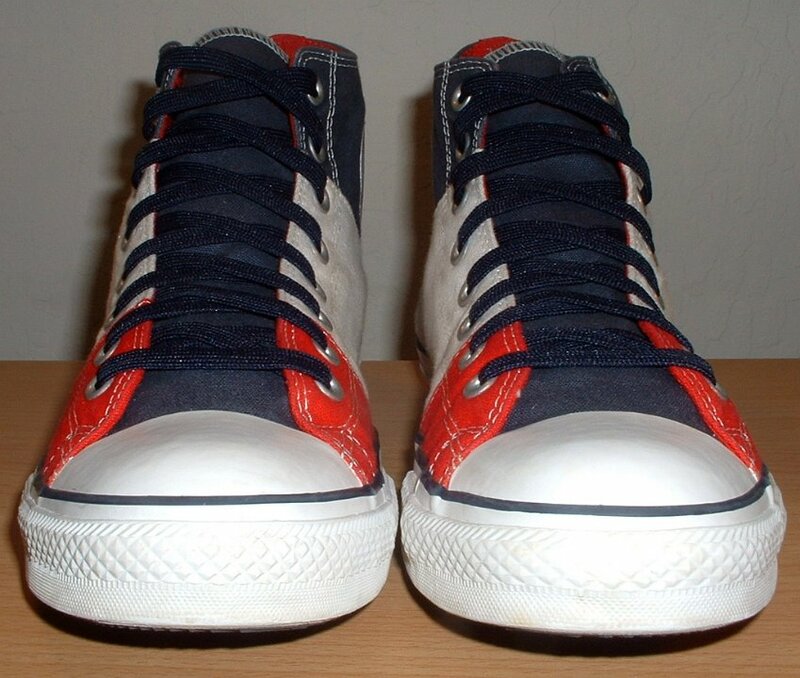 26 Tri-Color Chucks Angled side view of red, white, and blue tri-color high tops. 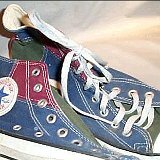 27 Tri-Color Chucks Angled side view of vintage blue, light blue, and red tri-color high top chucks. 28 Tri-Color Chucks Maroon, green, and white low cuts. 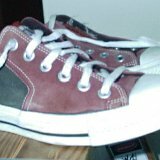 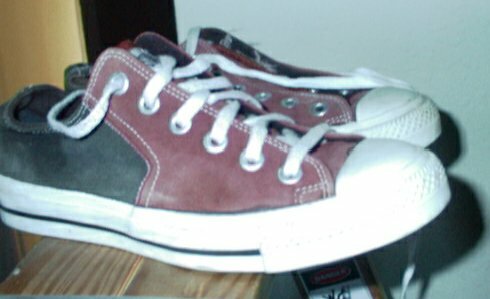 29 Tri-Color Chucks Maroon, black and white tri-color high tops. 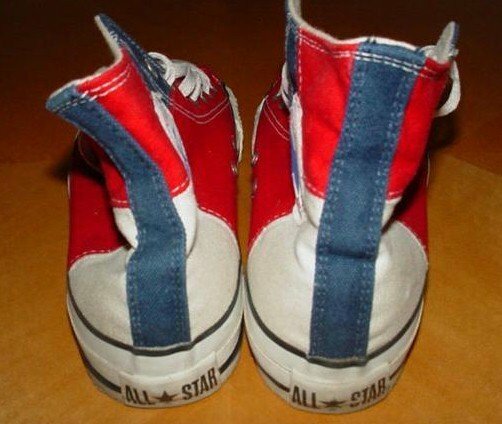 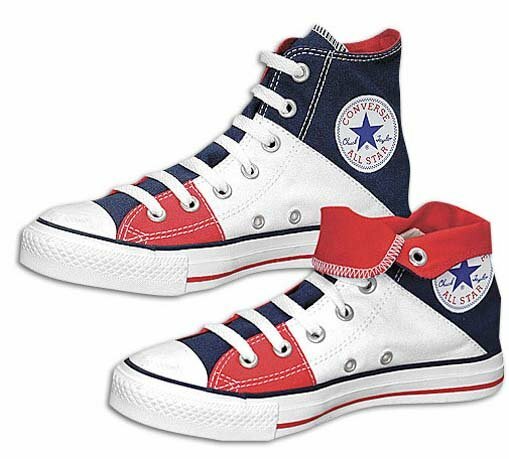 30 Tri-Color Chucks Inside patch and rear views of red, white, and blue tri-color high tops. 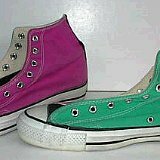 31 Tri-Color Chucks Angled side views of green, yellow, and pink tri-color high tops. 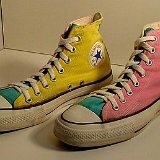 32 Tri-Color Chucks Angled outside views of green, yellow, and pink tri-color high tops. 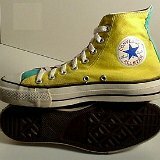 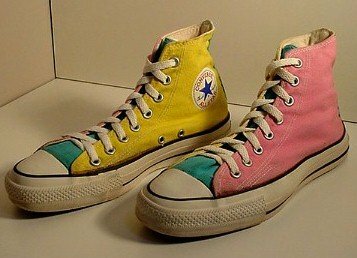 33 Tri-Color Chucks Inside patch and sole views of green, yellow, and pink tri-color high tops. 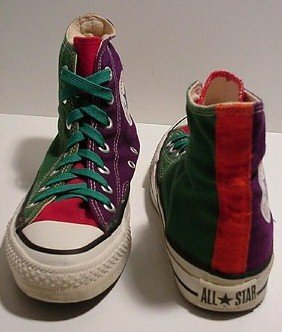 34 Tri-Color Chucks Angled side views of maroon, green, and red tri-color high tops. 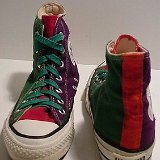 35 Tri-Color Chucks Front view of maroon, green, and red tri-color high tops. 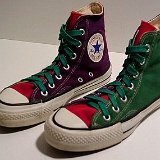 36 Tri-Color Chucks Rear view of maroon, green, and red tri-color high tops. 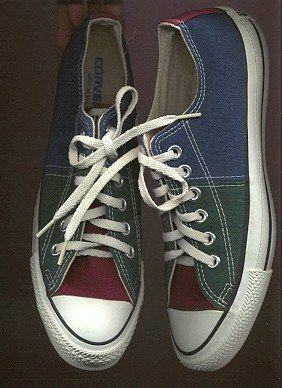 37 Tri-Color Chucks Angled side view of blue, green, and maroon tri-color high tops. 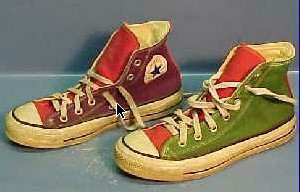 38 Tri-Color Chucks Front and rear views of blue, green, and maroon tri-color high tops. 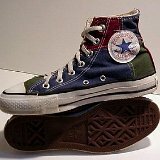 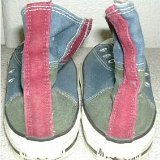 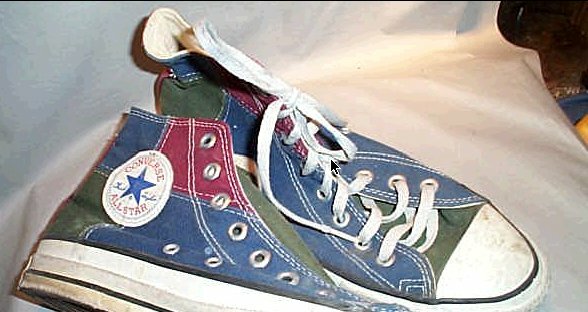 39 Tri-Color Chucks Inside patch and sole views of blue, green, and maroon tri-color high tops. 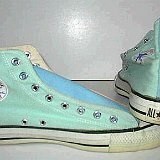 40 Tri-Color Chucks Salmon, Sky Blue, and Light Green tri color high tops, inside patch and rear views. 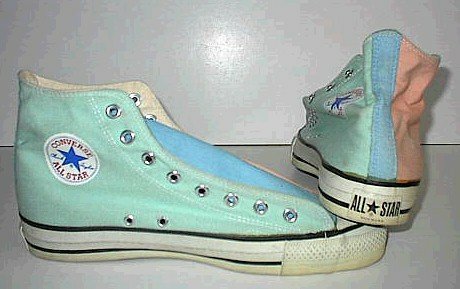 41 Tri-Color Chucks Salmon, Sky Blue, and Light Green tri-color high tops, outside and inside patch views. 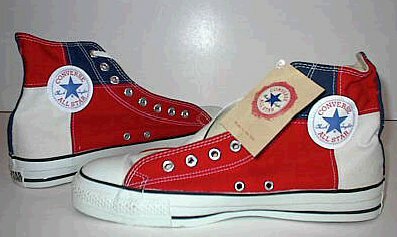 42 Tri-Color Chucks Red white and red tri-color high tops. 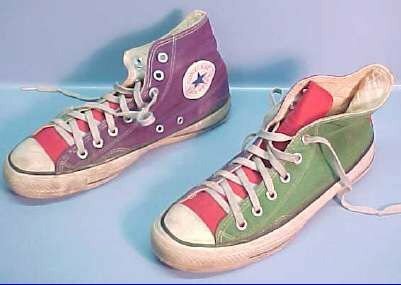 43 Tri-Color Chucks Green, red, and maroon high tops. 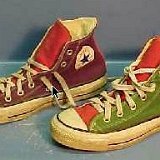 44 Tri-Color Chucks Green, red, and maroon high tops. 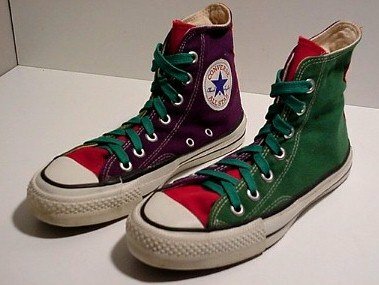 45 Tri-Color Chucks Green, red, and maroon high tops. 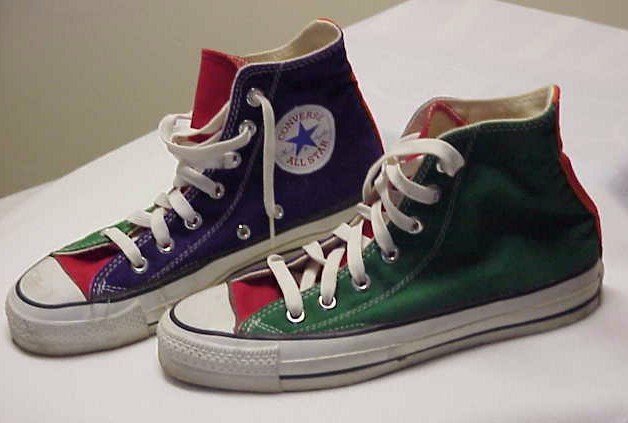 46 Tri-Color Chucks Green, red, and maroon high tops. 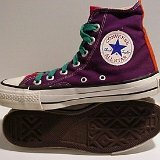 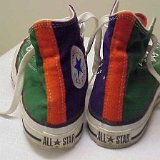 47 Tri-Color Chucks Green, purple, and orange tri-color high tops. 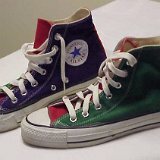 48 Tri-Color Chucks Green, purple, and red tri-color high tops. 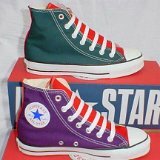 49 Tri-Color Chucks Green, purple, and red tri-color high tops. 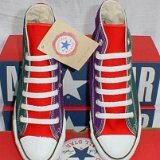 50 Tri-Color Chucks Brand new green, purple, and red tri-color high tops with box. 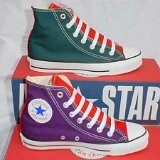 51 Tri-Color Chucks Brand new green, purple, and red tri-color high tops with box. 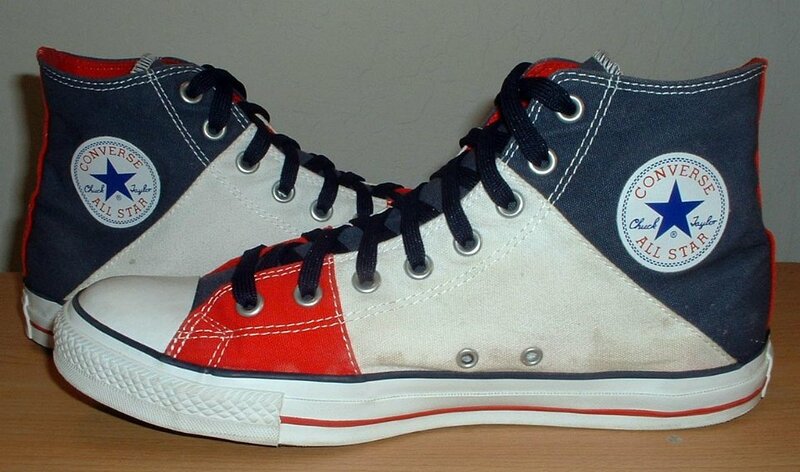 52 Tri-Color Chucks Red, white, and blue tri-color high tops. 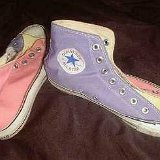 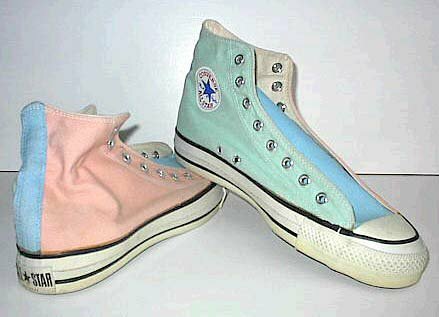 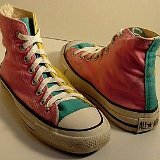 54 Tri-Color Chucks Rare four color high top in salmon pink, sky blue, lilac, and yellow. 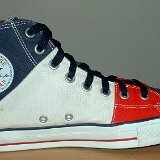 56 Tri-Color Chucks Red, white, and blue tri-color high tops. 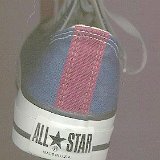 57 Tri-Color Chucks Closeup of the ankle patch. 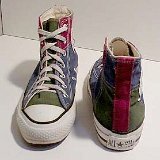 58 Tri-Color Chucks Rear view of right, white, and blue tri-color high tops. 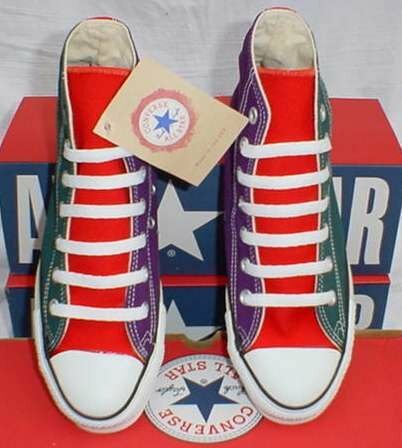 59 Tri-Color Chucks New green, maroon, and blue tri-color low cuts. 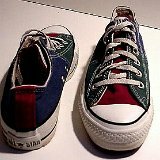 61 Tri-Color Chucks New green, maroon, and blue tri-color low cuts. 62 Tri-Color Chucks New green, maroon, and blue tri-color low cuts. 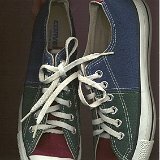 64 Tri-Color Chucks New green, maroon, and blue tri-color low cuts. 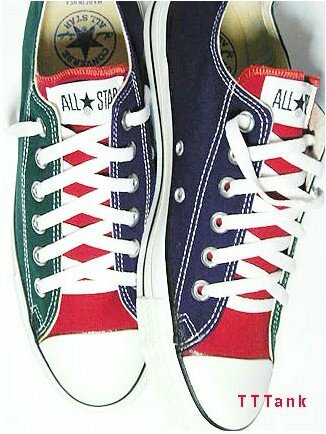 65 Tri-Color Chucks New green, maroon, and blue tri-color low cuts. 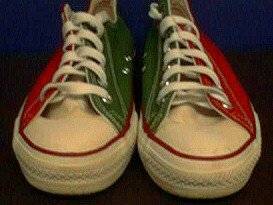 66 Tri-Color Chucks Top view of red, green, and white tri-color chucks. 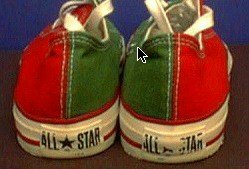 67 Tri-Color Chucks Top view of red, green, and white tri-color chucks. 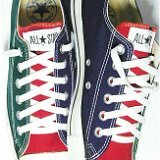 68 Tri-Color Chucks Top view of brand new red, green, and blue tri-color chucks. 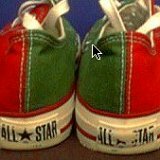 69 Tri-Color Chucks Side view of red, green, and white tri-color chucks. 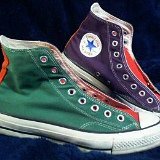 70 Tri-Color Chucks Sole view of red, green, and white tri-color chucks. 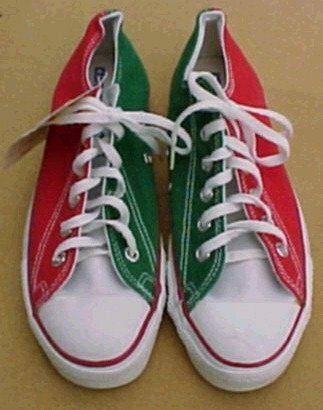 71 Tri-Color Chucks Front view of red, green, and white tri-color chucks. 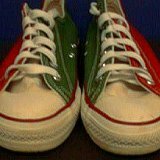 72 Tri-Color Chucks Side view of red, green, and white tri-color chucks. 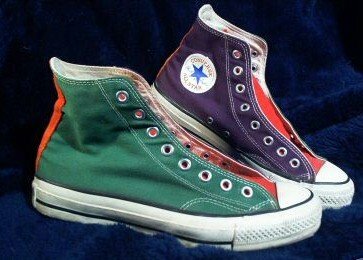 73 Tri-Color Chucks Rear view of red, green, and white tri-color chucks. 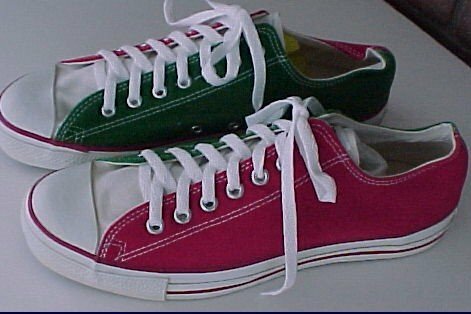 74 Tri-Color Chucks Side view of red, green, and white tri-color chucks. 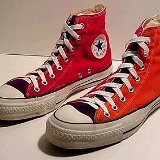 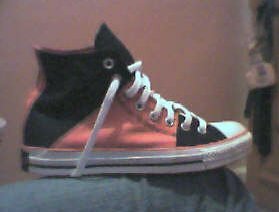 75 Tri-Color Chucks Angled side view of red, orange, and black tri-color high tops. 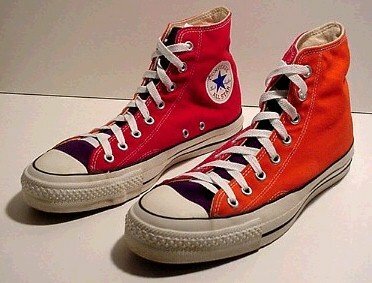 76 Tri-Color Chucks Front and back views of red, orange, and black tri-color high tops. 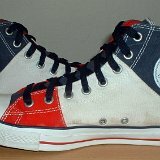 77 Tri-Color Chucks Wearing red, white and blue tri-color high tops, front view. 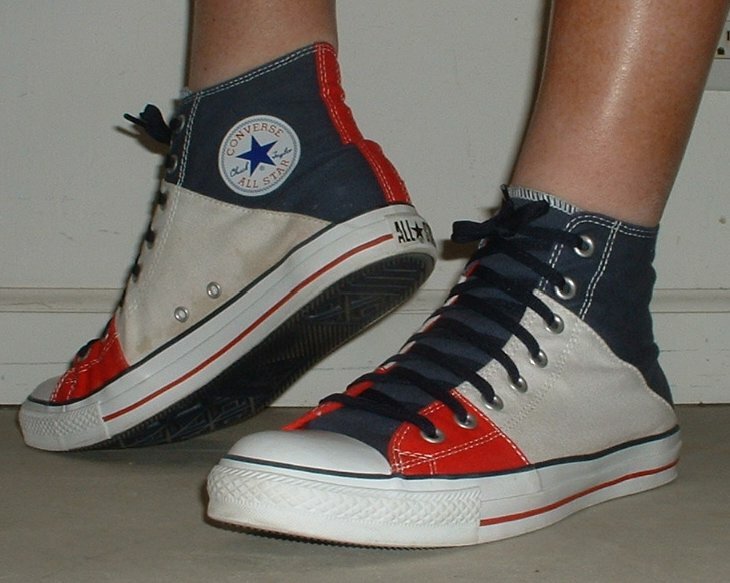 78 Tri-Color Chucks Wearing red, white and blue tri-color high tops, front view. 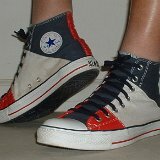 79 Tri-Color Chucks Wearing red, white and blue tri-color high tops, front view. 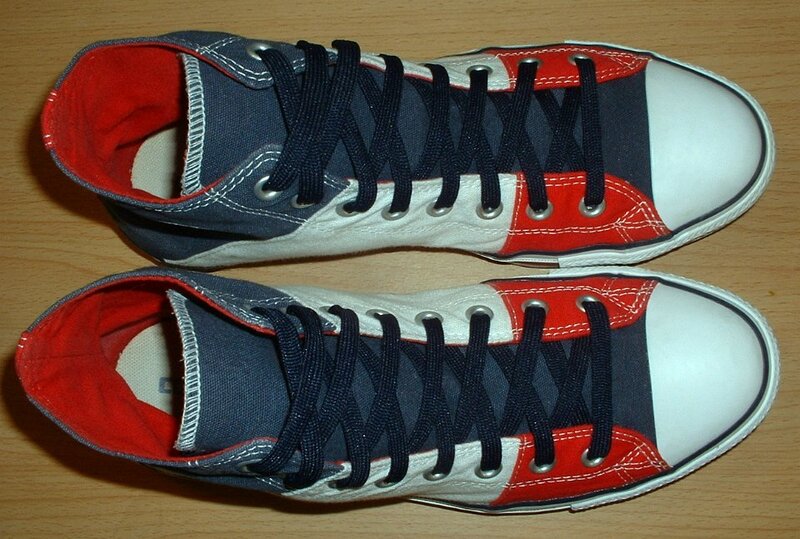 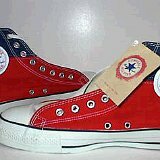 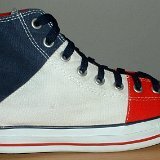 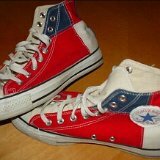 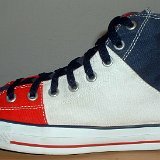 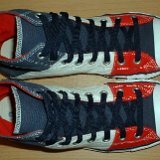 80 Tri-Color Chucks Wearing red, white and blue tri-color high tops, side view. 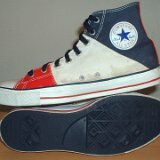 81 Tri-Color Chucks Wearing red, white and blue tri-color high tops, side view. 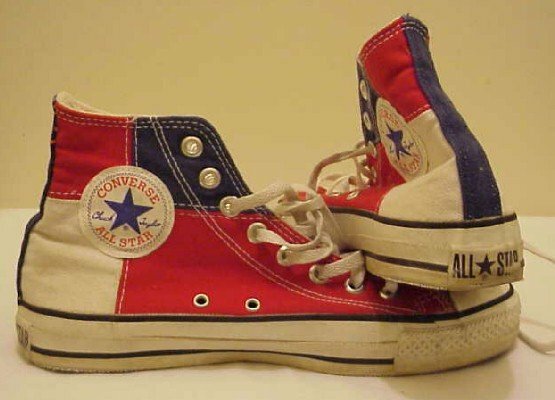 82 Tri-Color Chucks Wearing red, white and blue tri-color high tops, rear view. 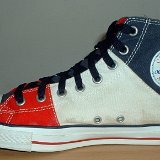 83 Tri-Color Chucks Wearing red, white and blue tri-color high tops, front view. 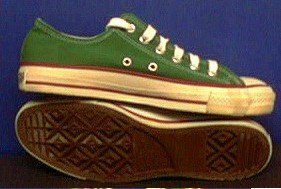 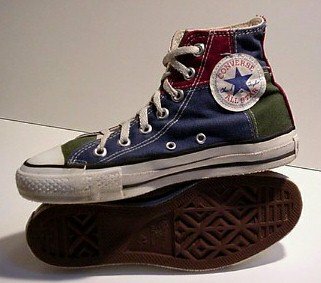 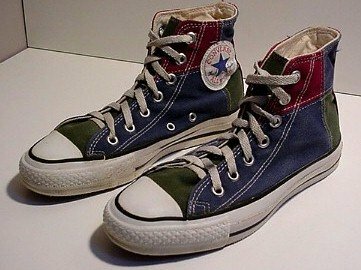 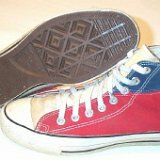 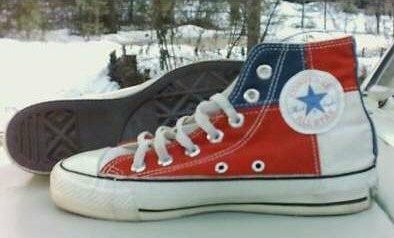 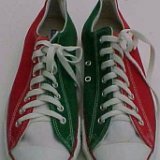 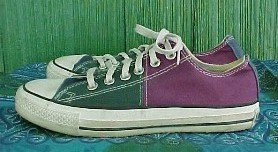 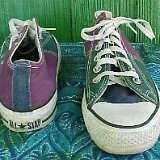 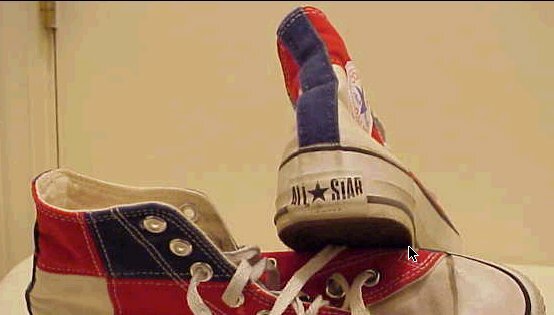 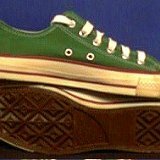 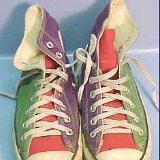 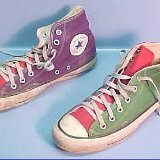 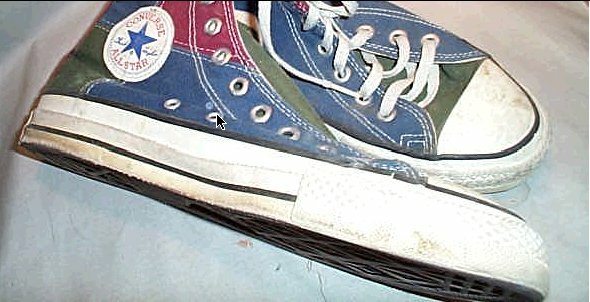 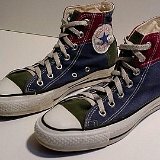 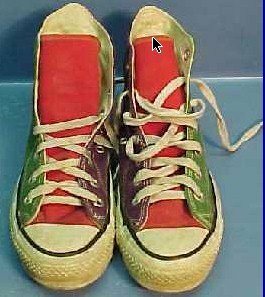 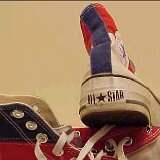 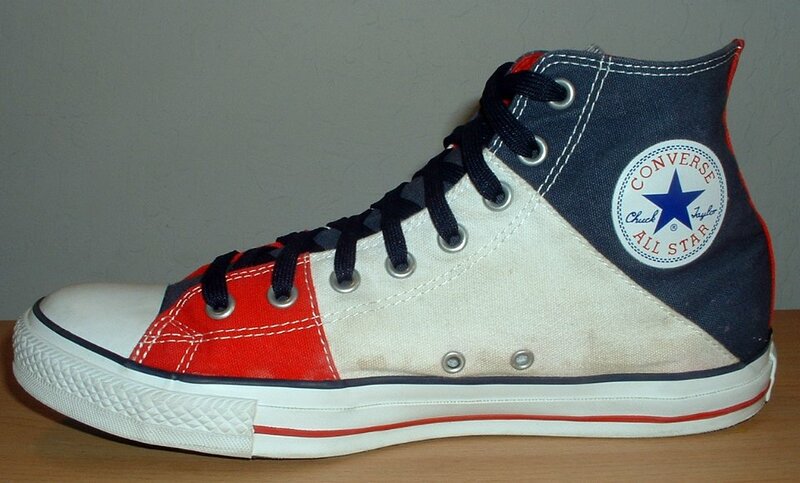 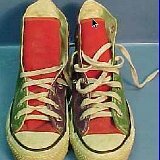 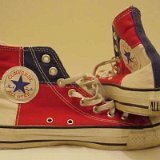 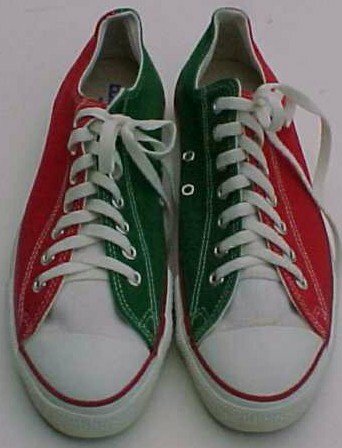 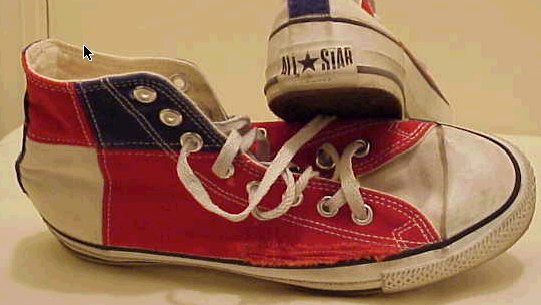 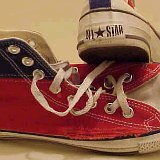 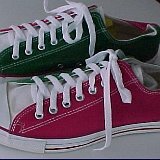 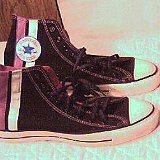 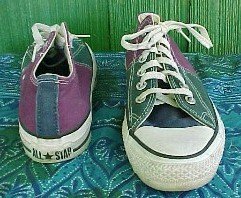 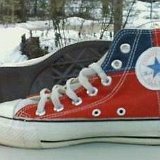 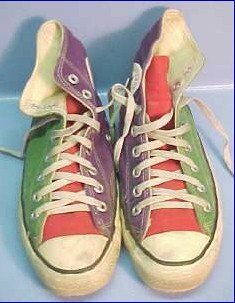 Tri-color Chucks were issued occasionally during the eighties and nineties before the bankruptcy. 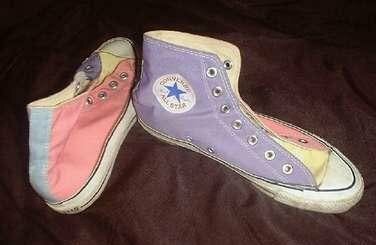 There were many variations. 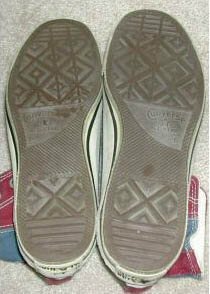 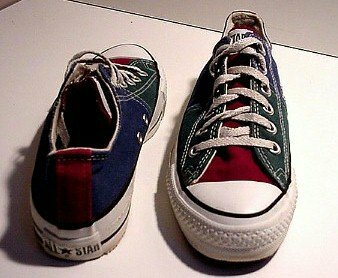 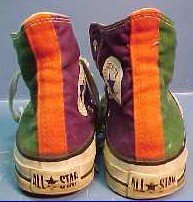 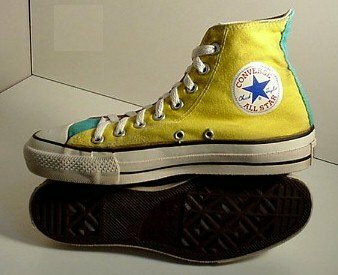 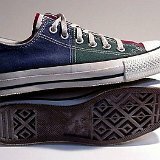 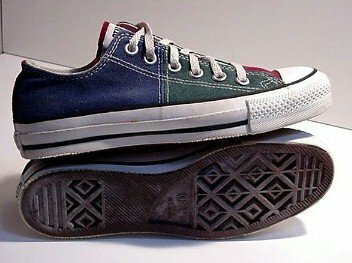 Some tri-color chucks had different colored uppers on each side with the tongue having the third color. 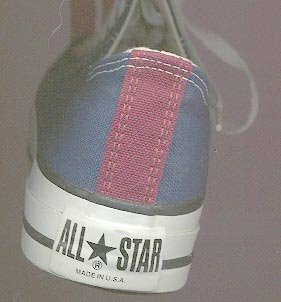 Other models used patches of color, like the red, white, and blue model. 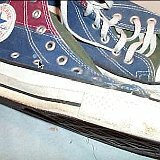 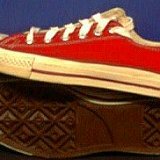 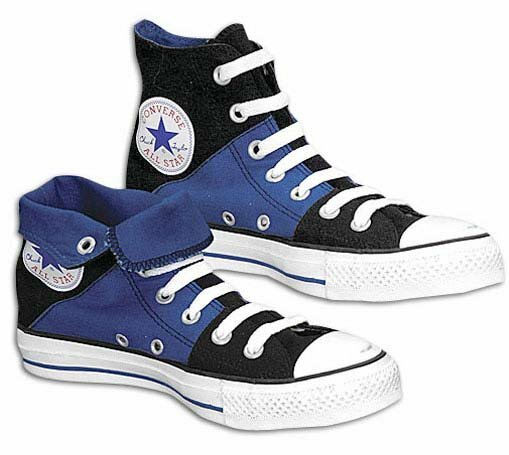 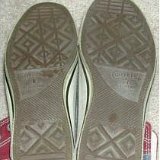 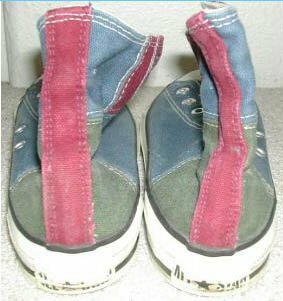 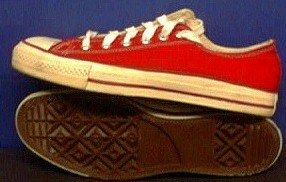 Some foldover models of chucks are made in three colors although most models are two color chucks. 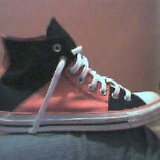 (If you consider the white foxing and laces, they are tri-color!) 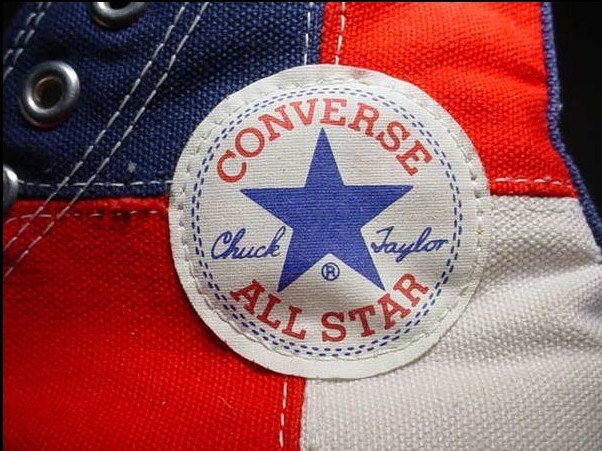 Also, Converse released a complete line of two color chucks in both high top and low cut called Chuck Taylor 2-Tone. 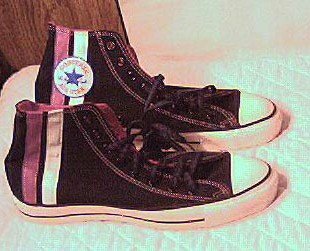 (Again, if you consider the white foxing and laces, they were tri-color!). 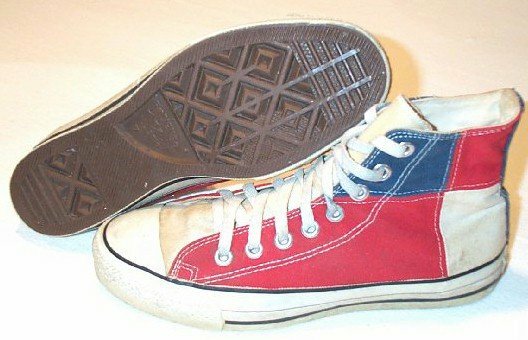 Tri-color or 2-tone chucks aren't made anymore. 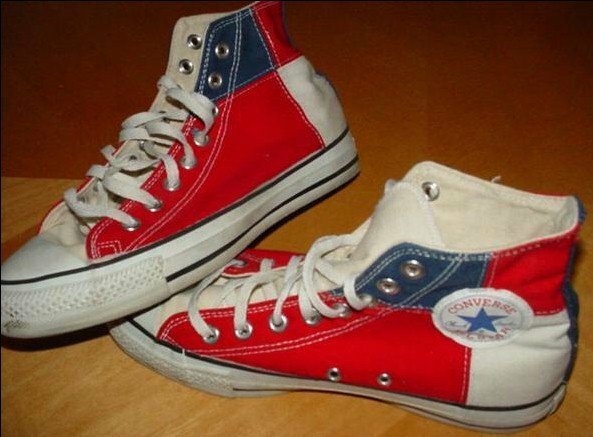 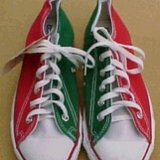 These days if you want a tricolor pair, go to the Converse website and design your own.